Q: Do I have to be a runner to participate in this 5K? A: No! Many are walkers, and many have never entered a race before. You just need to be able to complete the 3.1 miles comfortably walking or running. Q: How do I know if I can complete the 3.1 miles? A: If you can walk for an hour, you are probably covering the distance. Check out this training program from Runners World if you want help preparing: http://www.runnersworld.com/subtopic/0,7123,s6-238-244-259-0,00.html. Q: Do you allow baby joggers/strollers? A: Yes, but for everyone’s safety they must start at the back of the run line-up and walk line-up at the beginning of the event. Following these guidelines will help prevent accidents as well as avoid harm to yourself, your child and other runners. There is no extra fee; you do not need to register a child riding in a stroller. Sorry, wagons are not allowed. Q: Do I have to be a certain age to participate? 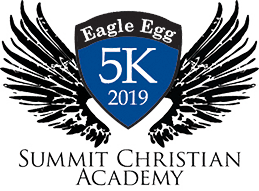 A: EE5K is open to all ages. In fact, children and teenagers are encouraged to participate! A: Sorry, dogs are not allowed on the race course. Q: What happens if I get sick, or I don’t end up attending the race? Can I give my entry to someone else, or get my money back? A: Sorry, entries are non-refundable and non-transferable. No exceptions. A: Park in the parking lot at Summit Christian Academy (1500 SW Jefferson in Lee's Summit, MO) . Q: What time do I need to be there before the start? A: If you have already picked up your packet, we recommend that you arrive at the start no later than 7:25 a.m. You’ll want to allow time to get through the restroom line, and visit with the other excited participants. If you need to pick up your packet, plan to arrive between 7 a.m. – 7:15 a.m., race day pick-up opens at 6:30 a.m. and closes at 7:30 a.m. If you have not registered, plan to arrive at 6:30 a.m. when registration opens. A: Yes, plan to arrive at 6:30 a.m. when race day registration opens. Please note that we can’t guarantee a race shirt for you but ordered quite a lot of shirts, but to be sure register by March 29. Q: Can I pick up a race packet for someone else? A: Yes, but please make sure they know you are picking it up for them, so they don’t come in themselves and find it missing. Q: Where can I store my personal belongings at the race? A: Please leave any valuables at home or locked in the trunk of your car. Q: How do I find out my finish time? A: Results will be posted on race day afternoon on this website under the Results Page. Q: Who benefits from this event? A: First - You Do!! - Health and fitness are essential to your well-being! Secondly Summit Christian Academy benefits. SCA is a nonprofit, nondenominational Christian School. A: Please email kwoodall@sca-kc.org or phone 816-525-1480 from 8 a.m. – 4 p.m. Monday – Friday.